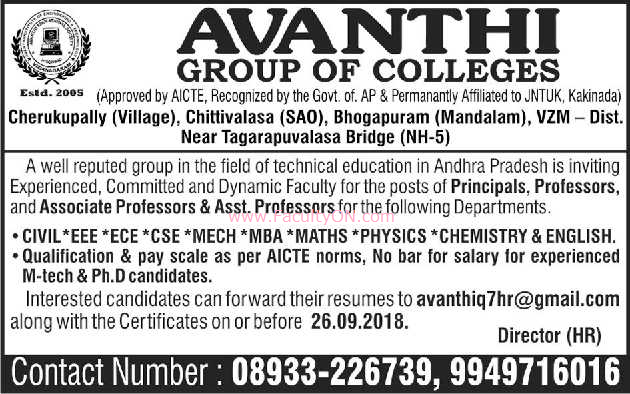 Avanthi Group of Colleges, Hyderabad has advertised in THE HINDU newspaper for recruitment of Professor / Associate Professor / Assistant Professor / Principal jobs vacancies. Interested and eligible job aspirants are requested to apply on or before 26th September 2018. Check out further more details below. About College: Avanthi is committed to improve the core competencies and it extends full support to its students, at all times, to meet with the global competitive edge as technical education has immense potentials to generate substantial economic growth in the country. Our students acquire knowledge and relevant skill sets through Classroom Lectures, Case Analysis, Team Work, Academic Projects and Expert Seminars which help develop their Conceptual, Analytical and Decision making Skills. How to Apply: Interested candidates are requested to send CV along with copies of certificates, copy of Aadhaar card, copy of PAN card and recent passport size photo to the email address provided below.